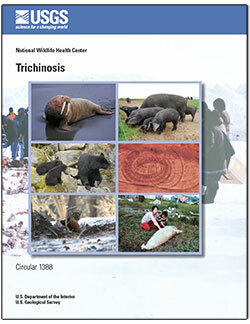 Trichinosis, or trichinellosis, is one of the most widespread global parasitic diseases of humans and animals. This ancient disease is caused by the larval stage of parasitic roundworms (nematodes) in the genus Trichinella. Often called the “trichina worm,” this parasite is considered to be the king of the parasite community, because it has adapted to an extremely wide range of hosts including domestic animals, wildlife, and humans. Trichinella spiralis is the usual cause of the disease in humans, but humans and many other mammals, birds, and reptiles also can be infected with other species or strains of Trichinella. Regardless of climate and environments, a wide variety of hosts on most continents are infected. Trichinella is transmitted through the ingestion of infected meat, primarily through predation or cannibalism of raw meat, and this ensures survival of the parasite in a wide variety of hosts. Humans become infected only by eating improperly cooked meat that contains infective larvae. While most people have only mild symptoms after infection, when high numbers of larvae are ingested trichinosis can cause serious disease, as well as death. Although trichinosis has been historically associated with pork, it is now emerging as a more widespread food-borne zoonosis as the consumption of wild game meat increases. Foreyt, William J., 2013, Trichinosis: Reston, Va., U.S. Geological Survey Circular 1388, 60 p., 2 appendixes, https://dx.doi.org/10.3133/cir1388.